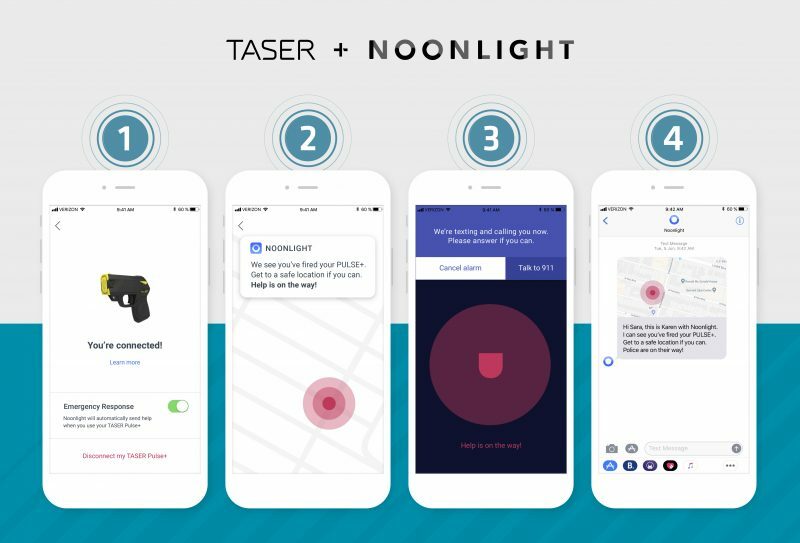 Consumer users of the new TASER Pulse+ will be able to alert emergency services automatically, thanks to Bluetooth plugin technology from a partnership with Noonlight, according to an announcement this week from TASER Self-Defense, the consumer division of Axon. When a TASER Pulse+ is deployed while the emergency-response setting is activated, the TASER device uses Bluetooth to activate the Noonlight application, automatically notifies law enforcement that an emergency situation exists and provides the user’s location, based on location technology found in an Android or iOS device, according to Nick Droege, founder of Noonlight (formerly SafeTrek). Noonlight uses its proprietary dispatching platform that interfaces with all U.S. public-safety answering points (PSAPs) to notify 911 personnel of incidents, Droege said. The PSAP does not need to have its infrastructure to be on migrating toward next-generation 911 (NG911) to receive the rich data information about an incident from Noonlight, he said. “The reality is that, to handle an emergency through us, all you need is access to a web browser that can be pulled up on your phone or the computer sitting in front of you, so it’s extremely easy,” Droege said. Annie Pratt, TASER Self-Defense director of consumer products, said that the ability for the TASER Pulse+ to give users the peace of mind that emergency help is coming when an incident occurs is critical. Droege said he is “excited” about the partnership with Axon, which aligns with Noonlight’s company philosophy. In the future, Noonlight hopes that its public-safety-notification platform can be integrated with myriad smart devices and sensors to alert first responders quickly when a health emergency or other response-worthy incident occurs. “Our vision is automatic safety, where the burden is completely removed from the user needing to do anything when they are in an emergency,” Droege said. “That comes with us furthering those partnerships with wearable devices and medical devices that can detect that you’re having a seizure or that you have fallen and trigger an emergency through our platform. Noonlight already has handled more than 93,000 emergency calls through its application, which includes an emergency button and the ability for users to provide update their profile with information that could be useful to first responders. A four-digit PIN lets a user cancel an emergency call at any time. To further reduce the possibility of delivering false alarms to public safety, the company processes calls with the company’s certified dispatchers that are available at all times, he said. “[If you are a Noonlight user making an emergency call,] you’re going to get a text from a real person,” Droege said. “If you don’t answer that text, you’re going to get one phone call. If you don’t answer that phone call, we transfer the emergency to the correct 911 PSAP, and they handle the emergency from there. This happens in about a minute’s time of you triggering the emergency. Noonlight allows users to report emergencies without having to speak. If a user is in a position where receiving a phone call could create a safety risk, they can respond to the text and tell the dispatcher not to call. Public-safety personnel’s reaction to Noonlight has been favorable, Droege said. Although Noonlight is able to ensure that emergency help is dispatched to an incident, the solution should not be considered as a substitute for 911, Droege said. “If you have the ability to talk, and you’re in an emergency, you should call 911,” Droege said. “What we have built makes getting help and communicating information about an emergency situation extremely easy, and we’ve standardized it everywhere in the U.S.—we don’t work differently in Idaho than we do in Florida; it works the same.